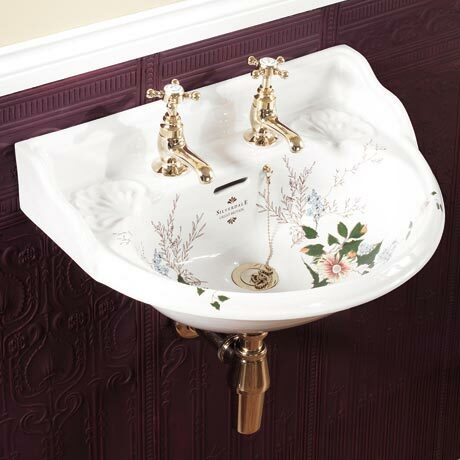 A beautifully traditional Victorian garden pattern 530mm wide wall mounted cloakroom basin from Silverdale Bathrooms. This stylish cloakroom basin is ideal for en-suites and cloakrooms where space is at a premium. Features a elegant Victorian garden pattern which has been fired into the glaze and a curved front with distinctive high splash backs. Each individual piece of sanitary ware has been carefully considered in its design, being based on authentic original pieces and lovingly re-created. Please note - Taps, Bottle traps and wastes shown in images are not included.